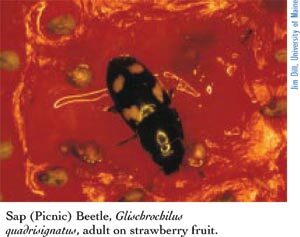 Adult beetles are 3/16" long and are black, or black with orange spots. The adult beetles survive the winter under plant debris along hedgerows or in fields. Eggs may be deposited in rotting fruit and on silk or in kernels at the tip of the ear. Larvae resemble tiny worms or thin maggots. Populations build when attracted to decomposing fruit,cull piles, or corn ears injured by birds or caterpillars. Ears with exposed tips, especially super sweet and Bt varieties, are susceptible to infestation. To prevent or reduce damage, select varieties that have good tip cover, use clean cultivation, control ear-infesting caterpillars and remove or bury decomposing fruit on a regular basis. Insecticides will not completely control heavy infestations.